Set your pricing right by automatically analysing your competitors’ offers and setting automated dynamic pricing on your website. The Australian retail sector is now transitioning faster from fixed prices to dynamic pricing specially e-commerce retailers as new developments in artificial intelligence and dynamic pricing software are available and are radically changing the relationship between sellers and buyers, specially online businesses are leading the way. 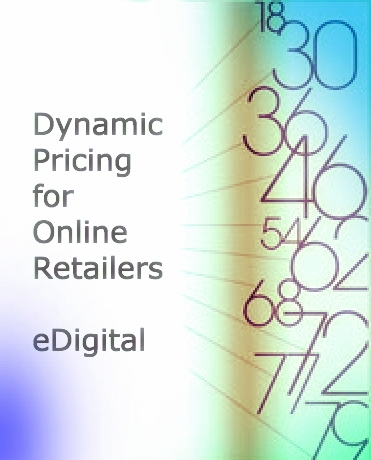 eDigital an help online retailers (e-commerce businesses) obtain a better understanding of what it takes to improve their profitability by the correct implementation of Pricing Intelligence Software and Dynamic Pricing methodologies. Selling online can be extremely price competitive and complicated to keep on top of the best pricing strategies. Specially when you have thousands of SKU’s and you are selling on different places such as ebay, google shopping, amazon, and other websites. We know that in some situations, your e-commerce website want to beat your competitors’ prices, but also you want to optimise your profit margins at the same time. Regardless of what e-commerce solution you have implemented ie Magento, BigCommerce, Shopify, WooCommerce or any others, you have great opportunities to optimise your pricing strategy. We can show you tangible dynamic pricing examples and how they work in real life. There is no surprise successful companies such as Airline Jetstar, car sharing Uber (urge in pricing – peak times), movie tickets app Choovie, fashion e-commerce site Net-A-Porter, travel website Orbitz, Amazon Go, Wallmart, Bestbuy, Coop Norden (Denmark) are using dynamic pricing strategies and software to be competitive and increase profit margins. Tesco and Sainsbury’s in the UK are on the way to implement electronic “surge” pricing within the next five years, jacking up prices during the lunch rush, the traditional Sunday evening grocery shopping peak or on public holidays. Even railways in India are planning to adopt Dynamic pricing for festivals such as Diwali, Durga Puja and discounts for travelling odd- hours, choosing a less popular route or train or one having no pantry services. Whether your business is located in Sydney, Melbourne, Brisbane or any other major city in Australia, you have tremendous opportunities to better manage your profitability by implementing dynamic pricing strategies. HOW TO ACTION THE BEST DYNAMIC PRICING STRATEGIES? eDigital can help your business to improve your profit margins by executing best dynamic pricing practices and strategies and software implementations. Knowing your customers, and your store’s demand curves are the building blocks of creating and executing a great pricing strategy. 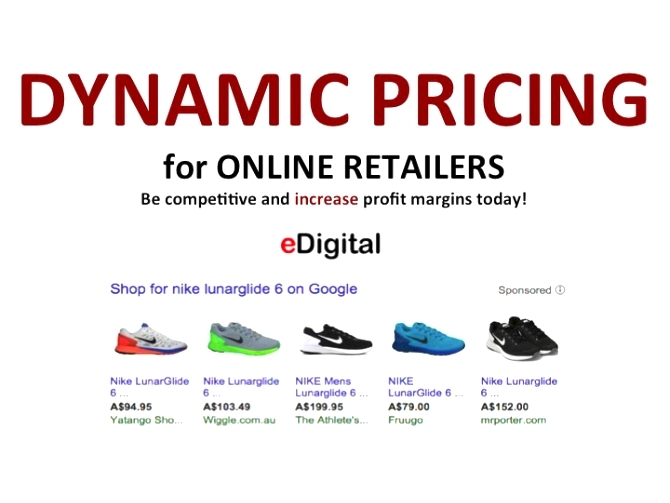 eDigital dynamic pricing advice can help retailers who sell online to maximize their profits by up to 25% in just a few months. Our dynamic pricing consulting services help online retailers with ways to increase profit margins, as well as how to master different aspects to digital marketing your online store, such conversion rate optimisation via A/B Testing or multivariable testing. Our clients also learn how they can create laser focused promotions and campaigns to make sure they are reaching the proper buyer group without additional costs. “By understanding the importance of margins, and the strategies and tools to improve them, online retailers can get the most out of their pricing strategies“ Mauricio Escobar said. During the whole month of Feb 2018 we are giving away free consultation sessions on how to alert your online visitors when your products they are interested in drop in price or are restocked. The end goal is to have the shopper complete the purchase as a result of these type of notifications/alerts. These alerts make it possible for retailers to re-market to their customers to improve the likelihood of checkout. Abandoned carts are a major problem for online retailers. Approximately 72% of online shoppers are likely to abandon their carts and only 8% will return to make the purchase. Implementing the right “Alerts” tool will make you reduce cart abandonment rates. Learn more why dynamic pricing is a must of e-commerce retailers on this article by eConsultancy. Ready to have a chat about dynamic pricing? Contact eDigital today!